Edhi Air Ambulance is another millstone by the Edhi Foundation to serve the humanity. Edhi Foundation is the world’s largest social welfare organization. Founded the great person late Abdul Sattar Edhi, it is one of the top social welfare service providers across the world running on non-commercial, non-political and non-communal basis. From shield, upbringings to wellbeing – Edhi foundation covers everything. The foundation provides shelter to homeless orphans, olds and abandoned infants. There is a good news for the people of Karachi, Edhi Foundation, which is serving the humanity since many years, has started its air ambulance service in Karachi. Edhi Foundation has added a light, six-seater plane to its air ambulance service. In this regard a six-seat Cessna 206 has been handed over to the Edhi air ambulance wing at the old Karachi airport by the managing trustee of the foundation Faisal Edhi. Edhi foundation has planned to enlarge its taskforce in order to offer the people of remote areas to grab their hands on the fastest health care service with the Edhi Ambulance Service in case of an emergency. The plan will fortify the charity’s air ambulance service, as it will support implement the rescue services in far-fetched areas. The set-up cost of the airplane is Rs. 50,000 per hour whereas its gaining cost the organization Rs. 55 million. The Edhi air ambulance service already has a Piper Seneca aircraft and a Bell 206 helicopter that serve its services in the natural disasters. The managing trustee of the foundation Faisal Edhi said that the felt can offer the flight services to stuck or wounded people and instantly shift them to the nearby hospital during an emergency. Mr.Faisal has applauded the overseas Pakistanis living in Britain for their donations that permitted the acquisition of the aircraft to expand the Edhi air ambulance fleet. 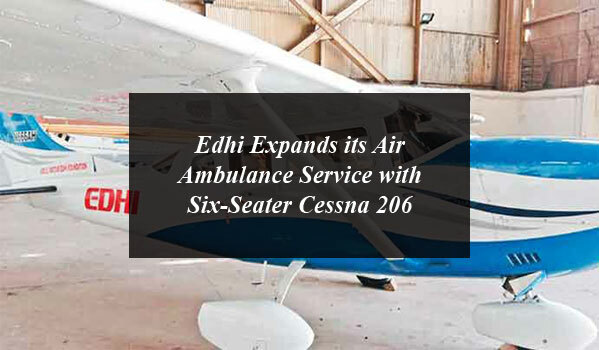 Edhi Expands its Air Ambulance Service with Six-Seater Cessna 206. Edhi Air Ambulance is another millstone by the Edhi Foundation to serve the humanity.